Here are three compelling reasons why you should consider and plan a public land ground attack this autumn to bag your deer. Most deer hunters use elevated stands, but there are places where it’s more practical, if not necessary, to hunt from the ground. Hunting above the ground gives a hunter multiple situational advantages. It elevates you above a deer’s sight line while allowing you to see farther. It can also reduce a deer’s chance of catching your scent. On the other hand, elevated stands also impose strategic disadvantages. Confinement to a fixed position in a tree restricts a hunter’s mobility, and hauling a stand in and out of the woods is a physical strain and a logistical hurdle. 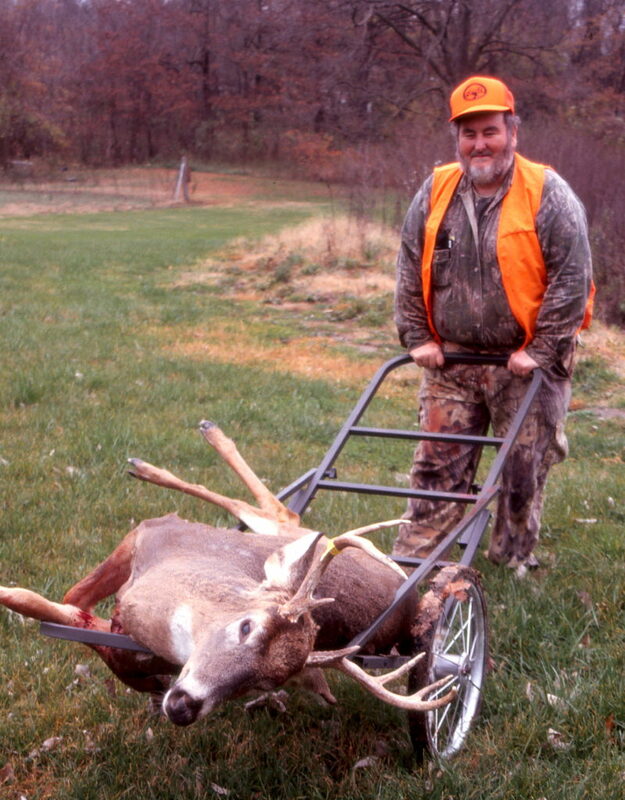 All three are major limitations when hunting on public ground, where mobility is paramount. That’s why a lot of public ground hunters prefer to ambush deer at eye level. Private land is generally a controlled environment. Access is limited, which largely eliminates the effects of intrusive behavior on deer movements and feeding patterns. This allows a hunter to scout and pattern local deer groups, as well as individual bucks in relaxed dispositions. A private land hunter can also positively influence deer behavior by planting food plots or placing attractants. Knowing precisely how deer use certain areas allows a hunter to place stands at several hotspots to take advantage of wind direction on any given day. None of this is possible on public land. All kinds of users traipse through national forests and state- owned management areas year round, viewing wildlife, picking berries, hunting for morels, hunting squirrels or just hiking recreationally. In 2016, for example, I drew a highly coveted spring turkey hunting permit on a state-owned wildlife management area in the Ozark Mountains of northwest Arkansas. That WMA is famous for its waterfalls, and they run fullest during the spring. A veritable parade of waterfall enthusiasts, none of which was aware nor appreciative of the fact that a permit-only turkey hunt was in progress, wrecked that day’s endeavors. In Arkansas and Missouri, everybody is a stakeholder in game and fish resources by virtue of a statewide 1/8th percent sales tax, so non-hunters are equally entitled as hunters to use the state’s WMAs. Such high levels of human intrusion affect deer behavior significantly, as do the sudden maturations of different food sources during the fall. A fresh pin oak acorn drop in an area can turn yesterday’s hotspot cold overnight. To stay in the game, you must be able to move quietly, quickly and sometimes far. Lugging stands is simply not conducive to success in such environments. Since deer on public land are already attuned to human intrusion, aren’t they even more likely to detect a hunter on the ground? In my experience, the answer is no, but I work hard to even the odds. At the aforementioned wildlife management area with the waterfalls, the Arkansas Game and Fish Commission controls all firearms deer hunt- ing by way of a random draw. In four of the past six years, I drew permits for the controlled muzzleloader hunt, and also one permit for the controlled modern gun hunt. Because the area is known for harboring good numbers of mature bucks, these are highly coveted permits, and participation is very high. Hunters at any public area exhibit several distinct patterns. First, they all hit the roads at roughly the same time to drive to their hunting areas. They concentrate at food plots, most of which are within sight of a road. Hunters kill a few deer at these plots on the first morning and first evening, but after that deer learn to avoid food plots during the daylight hours. Hunters leave the woods between 10 and 11 a.m. for lunch or to lounge around at camp, and they return to the woods about 90 minutes before sunset. These human behaviors generate distinctive noise, sight and scent patterns that alter deer behavior. 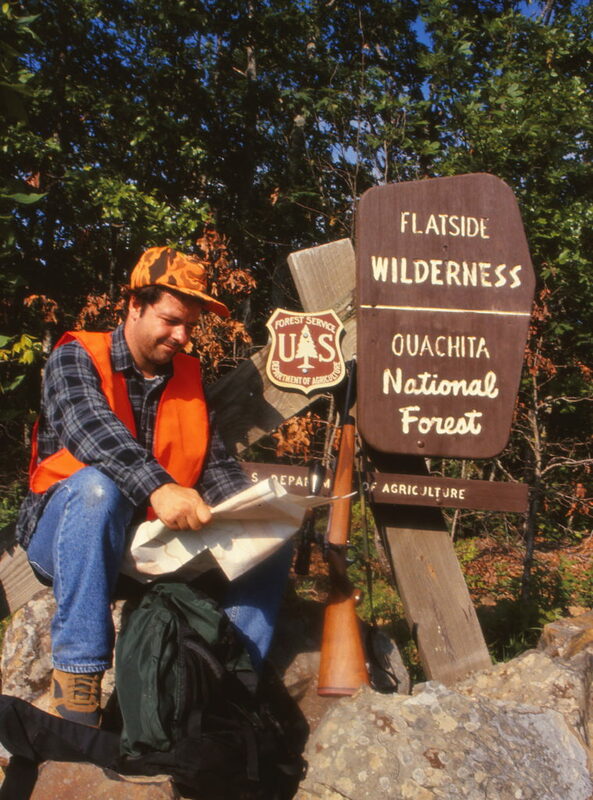 This partly explains why success rates in the Arkansas-controlled hunts are relatively low. I first drew a muzzleloader permit for this place six years ago. I immediately obtained a map and identified a few places that were farthest from a road. One was a ridge top on a corner of the WMA. A long, arduous walk across broken terrain led me to three openings that descend the gentlest sides of the ridge. Two benches at different elevations transit the slope. Two offer adequate sightlines to shoot a muzzleloader. At the tops of the openings are very old, very large pine trees. They provide a comfortable backrest when I sit in the low-slung collapsible ground chair that I initially bought for turkey hunting. The chair, a firearm and a small back-pack containing a few snacks, Thermos of coffee, a large bottle of water and a book of crossword puzzles comprises my entire kit. If I need to move, I can do it quickly and quietly. The preponderance of tracks shows that deer use the higher bench, which snakes through a persimmon thicket bounded on two sides by blackberry brambles and honeysuckle amid a grove of old growth white oaks and hickories. This bench snakes around the hillside, skirts a steep ravine, drops down to a derelict stretch of an old fence where deer cross a road to descend into a deep hollow. Those openings are the only two places on the entire mountainside where a deer traveling this route is ever exposed. My perch against the pine tree is about 65 to 70 yards above the bench. I have noticed that deer entering the bench look straight ahead or down the hill to the lower bench. Only once have I observed a deer looking uphill. I’ve also seen far more deer there in the evening. That is fortuitous because in the Ozarks, wind rushes up the hillsides in the evenings. My perch is never in their scent path. The one deer that looked uphill was during my first muzzleloader hunt. It was a spike buck that entered the bench, turned left and walked straight to me. My hunter orange cap and vest did not alarm it. In fact, we nearly touched noses, and the deer went its way alert, but unalarmed. My best experience was during the 2016 muzzleloader season, when in the waning minutes of daylight, a broad-racked 10-pointer stepped into the clearing perfectly broadside. A hangfire caused me to miss, but the experience highlights the possibilities when you escape the crowds and find sheltered, secure travel corridors. Khalil was with me when he killed his first deer, a 21⁄2-year-old 8-pointer, from the ground at rock-throwing range on the first Monday of then-modern gun season in the heavily pressured Ozark National Forest. Since then, Khalil has blossomed into a dedicated and accomplished hunter. He kills mature bucks in the Ouachita National Forest, in an area that receives intense hunting pressure due to the fact that it’s only about 35 minutes from downtown Little Rock. Khalil has also noted the habits of most public land hunters, and he looks for secluded draws and corridors where deer retreat to escape them. While these anecdotes are from experiences in mountainous regions, the same principles apply when hunting lowland areas such as those in the Gulf Coastal Plain and in major river valleys. My most memorable hunt was one that made me fully appreciate the versatility of hunting on the ground. It was on Opening Day of rifle season at Missouri’s Lamine River Conservation Area, near Sedalia, Mo. A flurry of miscues and mistakes caused me to arrive at mid-morning. Ordinarily you can write off a day like that, but I knew the area well enough to know where to go for the best chance at solitude. About a half-mile from the parking lot, I descended into a brushy draw near a big pond. A cornfield was on one side of the draw and a grassy hillside was on the other side. A stiff breeze blew from left to right. I stood exposed in the wide open when a doe walked out of the brush in front of me at about 45 yards. She looked at me, twisted her ears and flicked her tail as I stood statue still. Then, she whipped her head around. The doe continued walking as I dropped to a knee. Seconds later, a 2 1⁄2-year-old 8-pointer appeared in the opening, neck stretched forward and his lips peeled back. A few minutes later, he wore my tag. — Bryan Hendricks is the Outdoors Editor for the Arkansas Democrat-Gazette in Little Rock, Arkansas. 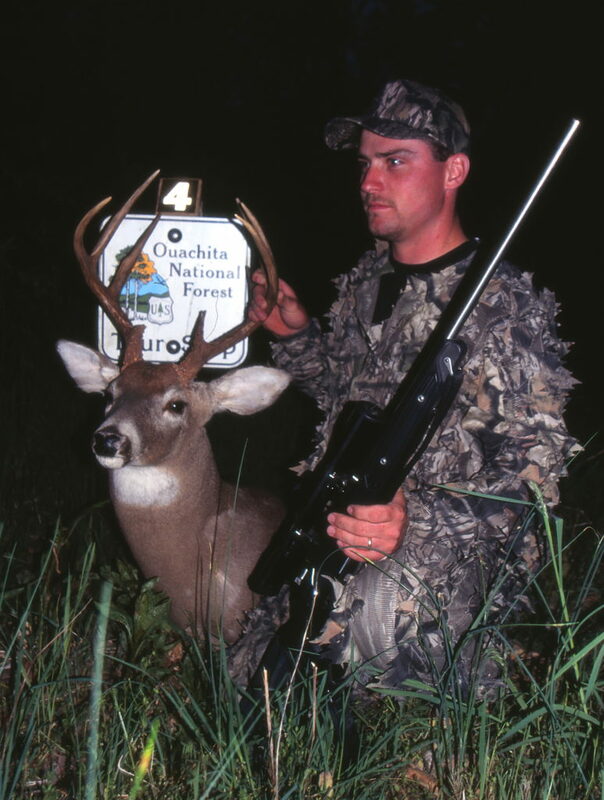 He is an avid deer hunter who covers all aspects of deer management in the Natural State.